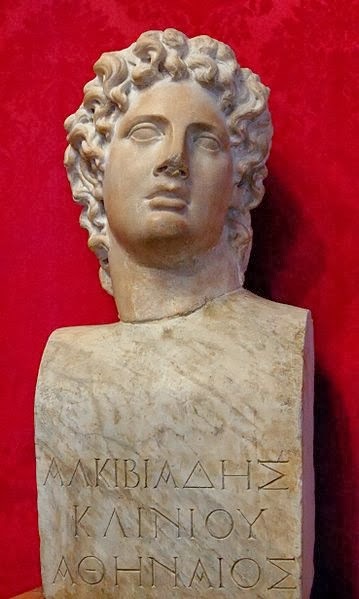 ALCIBIADES, as it is supposed, was anciently descended from Eurysaces, the son of Ajax, by his father’s side; and by his mother’s side from Alcmæon. Dinomache, his mother, was the daughter of Megacles. His father, Clinias, having fitted out a galley at his own expense, gained great honor in the sea fight at Artemisium, and was afterwards slain in the battle of Coronea, fighting against the Bœotians. Pericles and Ariphron, the sons of Xanthippus, nearly related to him, became the guardians of Alcibiades. It has been said not untruly that the friendship which Socrates felt for him has much contributed to his fame; and certain it is, that, though we have no account from any writer concerning the mother of Nicias or Demosthenes, of Lamachus or Phormion, of Thrasybulus or Theramenes, notwithstanding these were all illustrious men of the same period, yet we know even the nurse of Alcibiades, that her country was Lacedæmon, and her name Amycla; and that Zopyrus was his teacher and attendant; the one being recorded by Antisthenes, and the other by Plato. His conduct displayed many great inconsistencies and variations, not unnaturally, in accordance with the many and wonderful vicissitudes of his fortunes; but among the many strong passions of his real character, the one most prevailing of all, was his ambition and desire of superiority, which appears in several anecdotes told of his sayings whilst he was a child. Once being hard pressed in wrestling, and fearing to be thrown, he got the hand of his antagonist to his mouth, and bit it with all his force; and when the other loosed his hold presently, and said, “You bite, Alcibiades, like a woman.” “No,” replied he, “like a lion.” Another time as he played at dice in the street, being then but a child, a loaded cart came that way, when it was his turn to throw; at first he called to the driver to stop, because he was to throw in the way over which the cart was to pass; but the man giving him no attention and driving on, when the rest of the boys divided and gave way, Alcibiades threw himself on his face before the cart, and, stretching himself out, bade the carter pass on now if he would; which so startled the man, that he put back his horses, while all that saw it were terrified, and, crying out, ran to assist Alcibiades. When he began to study, he obeyed all his other masters fairly well, but refused to learn upon the flute, as a sordid thing, and not becoming a free citizen; saying, that to play on the lute or the harp does not in any way disfigure a man’s body or face, but one is hardly to be known by the most intimate friends, when playing on the flute. Besides, one who plays on the harp may speak or sing at the same time; but the use of the flute stops the mouth, intercepts the voice, and prevents all articulation. “Therefore,” said he, “let the Theban youths pipe, who do not know how to speak, but we Athenians, as our ancestors have told us, have Minerva for our patroness, and Apollo for our protector, one of whom threw away the flute, and the other stripped the Flute-player of his skin.” Thus, between raillery and good earnest, Alcibiades kept not only himself but others from learning, as it presently became the talk of the young boys, how Alcibiades despised playing on the flute, and ridiculed those who studied it. In consequence of which, it ceased to be reckoned amongst the liberal accomplishments, and became neglected. It is stated in the invective which Antiphon wrote against Alcibiades, that once, when he was a boy, he ran away to the house of Democrates, one of those who made a favorite of him, and that Ariphron had determined to cause proclamation to be made for him, had not Pericles diverted him from it, by saying, that if he were dead, the proclaiming of him could only cause it to be discovered one day sooner, and if he were safe, it would be a reproach to him as long as he lived. Antiphon also says, that he killed one of his own servants with the blow of a staff in Sibyrtius’ wrestling ground. But it is unreasonable to give credit to all that is objected by an enemy, who makes open profession of his design to defame him. He esteemed these endeavors of Socrates as most truly a means which the gods made use of for the care and preservation of youth, 2 and began to think meanly of himself, and to admire him; to be pleased with his kindness, and to stand in awe of his virtue; and, unawares to himself, there became formed in his mind that reflex image and reciprocation of Love, or Anteros, 3 that Plato talks of. It was a matter of general wonder, when people saw him joining Socrates in his meals and his exercises, living with him in the same tent, whilst he was reserved and rough to all others who made their addresses to him, and acted, indeed, with great insolence to some of them. As in particular to Anytus, the son of Anthemion, one who was very fond of him, and invited him to an entertainment which he had prepared for some strangers. Alcibiades refused the invitation; but, having drunk to excess at his own house with some of his companions, went thither with them to play some frolic; and, standing at the door of the room where the guests were enjoying themselves, and seeing the tables covered with gold and silver cups, he commanded his servants to take away the one half of them, and carry them to his own house; and then, disdaining so much as to enter into the room himself, as soon as he had done this, went away. The company was indignant, and exclaimed at his rude and insulting conduct; Anytus, however, said, on the contrary he had shown great consideration and tenderness in taking only a part, when he might have taken all. He behaved in the same manner to all others who courted him, except only one stranger, who, as the story is told, having but a small estate, sold it all for about a hundred staters, which he presented to Alcibiades, and besought him to accept. Alcibiades, smiling and well pleased at the thing, invited him to supper, and, after a very kind entertainment, gave him his gold a gain, requiring him, moreover, not to fail to be present the next day, when the public revenue was offered to farm, and to outbid all others. The man would have excused himself, because the contract was so large, and would cost many talents; but Alcibiades, who had at that time a private pique against the existing farmers of the revenue, threatened to have him beaten if he refused. The next morning, the stranger, coming to the market-place, offered a talent more than the existing rate; upon which the farmers, enraged and consulting together, called upon him to name his sureties, concluding that he could find none. The poor man, being startled at the proposal, began to retire; but Alcibiades, standing at a distance, cried out to the magistrates, “Set my name down, he is a friend of mine; I will be security for him.” When the other bidders heard this, they perceived that all their contrivance was defeated; for their way was, with the profits of the second year to pay the rent for the year preceding; so that, not seeing any other way to extricate themselves out of the difficulty, they began to entreat the stranger, and offered him a sum of money. Alcibiades would not suffer him to accept of less than a talent; but when that was paid down, he commanded him to relinquish the bargain, having by this device relieved his necessity. Though Socrates had many and powerful rivals, yet the natural good qualities of Alcibiades gave his affection the mastery. His words overcame him so much, as to draw tears from his eyes, and to disturb his very soul. Yet sometimes he would abandon himself to flatterers, when they proposed to him varieties of pleasure, and would desert Socrates; who, then, would pursue him, as if he had been a fugitive slave. He despised every one else, and had no reverence or awe for any but him. Cleanthes, the philosopher, speaking of one to whom he was attached, says his only hold on him was by his ears, while his rivals had all the others offered them; and there is no question that Alcibiades was very easily caught by pleasures; and the expression used by Thucydides about the excesses of his habitual course of living gives occasion to believe so. But those who endeavored to corrupt Alcibiades, took advantage chiefly of his vanity and ambition, and thrust him on unseasonably to undertake great enterprises, persuading him, that as soon as he began to concern himself in public affairs, he would not only obscure the rest of the generals and statesmen, but outdo the authority and the reputation which Pericles himself had gained in Greece. But in the same manner as iron which is softened by the fire grows hard with the cold, and all its parts are closed again; so, as often as Socrates observed Alcibiades to be misled by luxury or pride, he reduced and corrected him by his addresses, and made him humble and modest, by showing him in how many things he was deficient, and how very far from perfection in virtue. Whilst he was very young, he was a soldier in the expedition against Potidæa, where Socrates lodged in the same tent with him, and stood next him in battle. Once there happened a sharp skirmish, in which they both behaved with signal bravery; but Alcibiades receiving a wound, Socrates threw himself before him to defend him, and beyond any question saved him and his arms from the enemy, and so in all justice might have challenged the prize of valor. But the generals appearing eager to adjudge the honor to Alcibiades, because of his rank, Socrates, who desired to increase his thirst after glory of a noble kind, was the first to give evidence for him, and pressed them to crown him, and to decree to him the complete suit of armor. Afterwards, in the battle of Delium, when the Athenians were routed and Socrates with a few others was retreating on foot, Alcibiades, who was on horseback, observing it, would not pass on, but stayed to shelter him from the danger, and brought him safe off, though the enemy pressed hard upon them, and cut off many. But this happened some time after. He gave a box on the ear to Hipponicus, the father of Callias, whose birth and wealth made him a person of great influence and repute. And this he did unprovoked by any passion or quarrel between them, but only because, in a frolic, he had agreed with his companions to do it. People were justly offended at this insolence, when it became known through the city; but early the next morning, Alcibiades went to his house and knocked at the door, and, being admitted to him, took off his outer garment, and, presenting his naked body, desired him to scourge and chastise him as he pleased. Upon this Hipponicus forgot all his resentment, and not only pardoned him, but soon after gave him his daughter Hipparete in marriage. Some say that it was not Hipponicus, but his son Callias, who gave Hipparete to Alcibiades, together with a portion of ten talents, and that after, when she had a child, Alcibiades forced him to give ten talents more, upon pretence that such was the agreement if she brought him any children. Afterwards, Callias, for fear of coming to his death by his means, declared, in a full assembly of the people, that if he should happen to die without children, the state should inherit his house and all his goods. Hipparete was a virtuous and dutiful wife, but, at last, growing impatient of the outrages done to her by her husband’s continual entertaining of courtesans, as well strangers as Athenians, she departed from him and retired to her brother’s house. Alcibiades seemed not at all concerned at this, and lived on still in the same luxury; but the law requiring that she should deliver to the archon in person, and not by proxy, the instrument by which she claimed a divorce, when, in obedience to the law, she presented herself before him to perform this, Alcibiades came in, caught her up, and carried her home through the market-place, no one daring to oppose him, nor to take her from him. She continued with him till her death, which happened not long after, when Alcibiades had gone to Ephesus. Nor is this violence to be thought so very enormous or unmanly. For the law, in making her who desires to be divorced appear in public, seems to design to give her husband an opportunity of treating with her, and of endeavoring to retain her. He had great advantages for entering public life; his noble birth, his riches, the personal courage he had shown in divers battles, and the multitude of his friends and dependents, threw open, so to say, folding doors for his admittance. But he did not consent to let his power with the people rest on any thing, rather than on his own gift of eloquence. That he was a master in the art of speaking, the comic poets bear him witness; and the most eloquent of public speakers, in his oration against Midias, allows that Alcibiades, among other perfections, was a most accomplished orator. If, however, we give credit to Theophrastus, who of all philosophers was the most curious inquirer, and the greatest lover of history, we are to understand that Alcibiades had the highest capacity for inventing, for discerning what was the right thing to be said for any purpose, and on any occasion; but, aiming not only at saying what was required, but also at saying it well, in respect, that is, of words and phrases, when these did not readily occur, he would often pause in the middle of his discourse for want of the apt word, and would be silent and stop till he could recollect himself, and had considered what to say. The emulation displayed by the deputations of various states, in the presents which they made to him, rendered this success yet more illustrious. The Ephesians erected a tent for him, adorned magnificently; the city of Chios furnished him with provender for his horses and with great numbers of beasts for sacrifice; and the Lesbians sent him wine and other provisions for the many great entertainments which he made. Yet in the midst of all this he escaped not without censure, occasioned either by the ill-nature of his enemies or by his own misconduct. For it is said, that one Diomedes, an Athenian, a worthy man and a friend to Alcibiades, passionately desiring to obtain the victory at the Olympic games, and having heard much of a chariot which belonged to the state of Argos, where he knew that Alcibiades had great power and many friends, prevailed with him to undertake to buy the chariot. Alcibiades did indeed buy it, but then claimed it for his own, leaving Diomedes to rage at him, and to call upon the gods and men to bear witness to the injustice. It would seem there was a suit at law commenced upon this occasion, and there is yet extant an oration concerning the chariot, written by Isocrates in defence of the son of Alcibiades. But the plaintiff in this action is named Tisias, and not Diomedes. There is extant an oration written by Phæax against Alcibiades, in which, amongst other things, it is said that Alcibiades made daily use at his table of many gold and silver vessels, which belonged to the commonwealth, as if they had been his own. “The man deserved the fate; deny ’t who can? Alcibiades was not less disturbed at the distinctions which Nicias gained amongst the enemies of Athens, than at the honors which the Athenians themselves paid to him. For though Alcibiades was the proper appointed person 4 to receive all Lacedæmonians when they came to Athens, and had taken particular care of those that were made prisoners at Pylos, yet, after they had obtained the peace and restitution of the captives, by the procurement chiefly of Nicias, they paid him very special attentions. And it was commonly said in Greece, that the war was begun by Pericles, and that Nicias made an end of it, and the peace was generally called the peace of Nicias. Alcibiades was extremely annoyed at this, and, being full of envy, set himself to break the league. First, therefore, observing that the Argives, as well out of fear as hatred to the Lacedæmonians, sought for protection against them, he gave them a secret assurance of alliance with Athens. And communicating, as well in person as by letters, with the chief advisers of the people there, he encouraged them not to fear the Lacedæmonians, nor make concessions to them, but to wait a little, and keep their eyes on the Athenians, who, already, were all but sorry they had made peace, and would soon give it up. And, afterwards, when the Lacedæmonians had made a league with the Bœotians, and had not delivered up Panactum entire, as they ought to have done by the treaty, but only after first destroying it, which gave great offence to the people of Athens, Alcibiades laid hold of that opportunity to exasperate them more highly. He exclaimed fiercely against Nicias, and accused him of many things, which seemed probable enough: as that, when he was general, he made no attempt himself to capture their enemies that were shut up in the isle of Sphacteria, but, when they were afterwards made prisoners by others, he procured their release and sent them back to the Lacedæmonians, only to get favor with them; that he would not make use of his credit with them, to prevent their entering into this confederacy with the Bœotians and Corinthians, and yet, on the other side, that he sought to stand in the way of those Greeks who were inclined to make an alliance and friendship with Athens, if the Lacedæmonians did not like it. It happened, at the very time when Nicias was by these arts brought into disgrace with the people, that ambassadors arrived from Lacedæmon, who, at their first coming, said what seemed very satisfactory, declaring that they had full powers to arrange all matters in dispute upon fair and equal terms. The council received their propositions, and the people was to assemble on the morrow to give them audience. Alcibiades grew very apprehensive of this, and contrived to gain a secret conference with the ambassadors. When they were met, he said: “What is it you intend, you men of Sparta? Can you be ignorant that the council always act with moderation and respect towards ambassadors, but that the people are full of ambition and great designs? So that, if you let them know what full powers your commission gives you, they will urge and press you to unreasonable conditions. Quit, therefore, this indiscreet simplicity, if you expect to obtain equal terms from the Athenians, and would not have things extorted from you contrary to your inclinations, and begin to treat with the people upon some reasonable articles, not avowing yourselves plenipotentiaries; and I will be ready to assist you, out of good-will to the Lacedæmonians.” When he had said thus, he gave them his oath for the performance of what he promised, and by this way drew them from Nicias to rely entirely upon himself, and left them full of admiration of the discernment and sagacity they had seen in him. The next day, when the people were assembled and the ambassadors introduced, Alcibiades, with great apparent courtesy, demanded of them, With what powers they were come? They made answer that they were not come as plenipotentiaries. Note 1. This fashionable Attic lisp, or slovenly articulation, turned the sound r into l. Colax, a flatterer; Corax, a crow. Note 2. In allusion to the philosophical theory which he quoted in the life of Theseus, that love is a divine provision for the care of the young. Note 3. Eros and Anteros, Love and Love-again. Note 4. The Proxenus, that is, who in the ancient cities exercised, in a private station, and as a matter of private magnificence and splendid hospitality (he being always a citizen of the state in which he resided) many of the duties of protection now officially committed to consuls and resident ministers.